I love to wear romantic (flowery) pieces and summer slips in Winter so I simply layer them with warm knits and wear warm cozy leggings underneath! Your header is so amazing! you look amazing darling. the outfit is so nice- bohemian and sweet and comfy.looking. it’s so lovely and refreshing to see someone wearing florals in the winter. there’s so much black everywhere this time of year. These photos are gorgeous. Definately got a very etheral vibe. ooooh you! love the washed-out dreamy light here. that cardigan is just what i need today. So summery^^ I like it so much! love your bag and your look! I love the soft color of your photos! Also the romper is very pretty paired with those lovely gloves and bag. that romper is absolutely the coolest thing ever. Very nice pictures. The look is very romantic. I really like the gloves. Great colors and lovely lighting! Such great inspiration for my next outfit! Check out my latest post and become a follower of “Color Me Blue”! J don’t belive it ! it’s the best j love it ! romantic ! you look great and you have a beautiful photos like always 😉 I love your floral romper! That romper is amazing! I love how you styled it with a chunky cardigan. It looks fantastic! Love your style, so natural! I love how smiley you are in all your photos, most fashion bloggers try and look all moody and trendy, but you just have great energy. Love the outfit as well! adorable romantic layering, love it! that dress is adorable and i love the combo with that oversize sweater! I’m totally in love with the new header, it perfectly reflects you aesthetics!!! I’m with you with the Navajo obsession, but it’s so hard to find good prints…love the opening ceremony’s ones, though. Love what you’re doing! Bye! 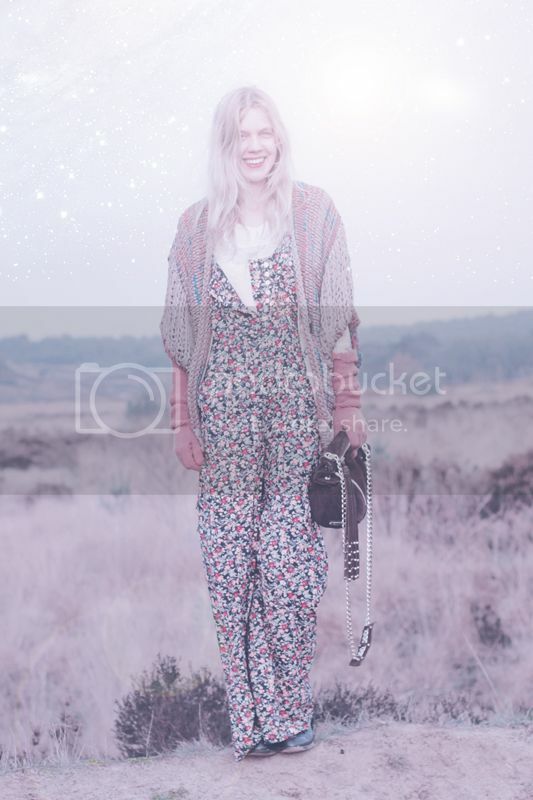 that floral jumpsuit is insane..
omg love the outfit and amazing photos!